The cabinet on Thursday approved the draft of the speech to be delivered by the President in the first parliament session of the next year. The approval came from a Cabinet meeting held at the Prime Minister's Office with Prime Minister Sheikh Hasina in the chair. 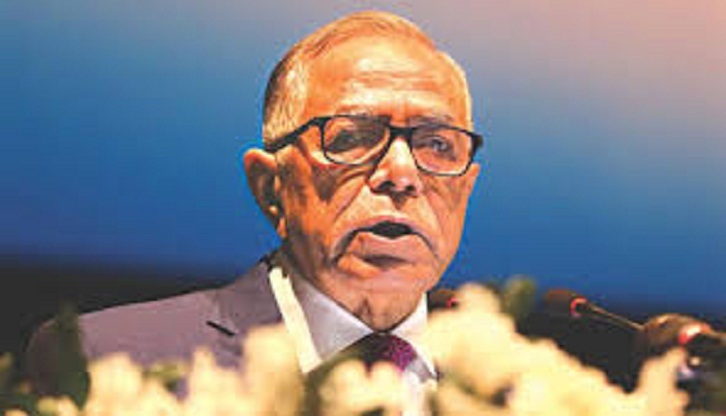 "The President's speech delivered in the first session of a year usually comprises of two parts -- the main speech and the abridged speech," cabinet secretary Mohammad Shafiul Alam told reporters in the cabinet division conference room of Bangladesh Secretariat. He said the speech of the President to be delivered in the first parliament session of the next year would highlight nine subjects, including the overall situation of the country and the macroeconomic scenario and steps taken for socio-economic development of the country. Among the other subjects to be focused on are successes achieved, programmes and guidelines in various sectors to implement the Vision 2021, implementation of various programmes for the development of ICT sector and thus building Digital Bangladesh. The president's speech will also cover employment generation at home and abroad, extension of the social safety net programmes, progress in the trial process of the war criminals, achievements in foreign relations, administrative policy and strategy, development philosophy, and the guidelines towards progress and prosperity. Shafiul said the main speech of the President would contain some 72,386 words while the abridged version would contain some 7,457 words. He said that the speech of the President in the first session of the parliament in the last year contained some 5,806 words, which was also delivered within one hour. The speech of the President would be finalized within January 4 next year, he said. The cabinet secretary said that at the very outset of the meeting, the Cabinet adopted a condolence motion at the death of Dhaka North City Corporation mayor Annisul Huq. The Cabinet in the obituary reference expressed deep shock at the death of Annisul and prayed for eternal peace of the departed soul. The cabinet also expressed profound sympathy for the bereaved family. Mayor Annisul Huq, 65, died in London's Wellington Hospital on November 30 after nearly three months of treatment there. He is survived by wife Rubana Huq, two daughters and one son. The Cabinet also extended thanks to all concerned as traditional art of Shital Pati weaving of Sylhet has been included in the Unesco's Representative List of the Intangible Cultural Heritage (ICH) of Humanity. The recognition came on Wednesday at the twelfth session of the Intergovernmental Committee for the Safeguarding of the ICH from December 4-9 at Jeju in South Korea. This is the fourth ICH from Bangladesh recognised by the Unesco. Earlier, Mangal Shobhajatra on Pahela Baishakh was recognised as the ICH last year, while Baul songs and traditional art of Jamdani weaving got the recognition in 2008 and 2013. Shital Pati is a handcrafted mat made by weaving together strips of a green cane known as "Murta". The mat is used by people all over Bangladesh as a sitting mat, bedspread or prayer mat.